During the spring of 2010, I started having trouble seeing out of my camera's viewfinder. I was so sure that something was wrong with my camera, that I sent it in for repairs. It turned out to be something far more serious. When I went for my annual optometrist visit, she referred me to a retina specialist. In great fear, I yelled out: "Am I going to be blind?? I was only 65 years old, a lonely widow(my 45-year old soul mate-husband had died of a brain tumor in 1993). I live alone, and pass long nights reading. My hobby is taking nature photographs, which I have about 10,000 of, the best of which I use for enlargements, and for making greeting cards. What would I do if I couldn?t take pictures, and read? The retina specialist never really answered my question, but did tell me about Lucentis. I elected to have it done right then and there, as I didn't want to worry about how getting jabbed in the eye would feel. Then, I started during Internet research on the Web, calling various MD telephone lines. I spoke to two of my neighbors: one, whose mother had to give up her favorite hobby - knitting - because of macular degeneration, and another, whose uncle had to give up driving. So besides losing my husband at an early age to a devastating illness, I am a breast cancer survivor, have chronic depression and insomnia, GERD, COPD , sleep apnea and now AMD. 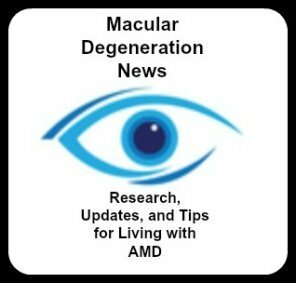 The initials should be MAD (macula age-related degeneration). What next, locusts? Why, me?? Am I going to be blind?? On October 1, 2010, in a state of total depression, fear, and almost despair, I decided to go for a walk. As was fitting, it had been raining. But, then, there it was : a rainbow. A glorious one, that lasted long enough for me to go get my camera. , written by Daniel L. Roberts, who has AMD, its monthly newsletter, and monthly TeleSupport group. (www.mdsupport.org, 1-888-633-3937; all is free, including the source-book, something for which I, on Social Security, am deeply grateful. I have learned to even more appreciate the sights, and sounds, and smells, of nature. I am learning to stay more in the moment and trying not to worry: Am I going to be blind? I am learning, to take things One Day at a Time. 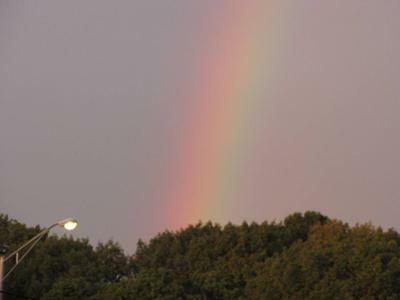 And, when I am down, I remember THE Rainbow - a sign to me that God IS walking with me during the storm. You sure do have a lot of problems but then like you said, God sent you a sign. Isn't it wonderful to know that God is there even in the midst of all the problems. I think our attitude is going to have a lot to do on whether this thing defeats us or not.